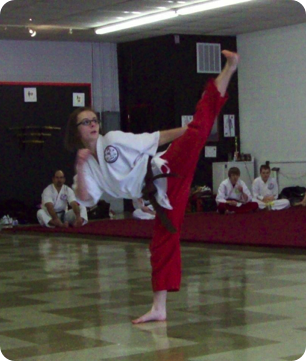 Sensei Brooke Clarke started taking martial arts at the age of 6 at N.M.A. After almost 10 years of training, Sensei Clarke achieved her black belt at the age of 15. Her father Sensei Jimmy Randall has been a major influence in her life as well as her brother Sensei Pittman and the other instructors. Sensei Clarke has a positive attitude and enjoys helping others learn. She wants to be able to help others achieve their black belt just as she did. “It wasn’t easy” Sensei Clarke adds, “but with my family pushing me forward and God on my side I never gave up”. Outside the dojo, Brooke enjoys singing, piano, and spending time with family and friends. After she graduates from Bandys High School, she plans to attend college.